Now you can try the Unique Revolutionary Extra Strength Solution that is giving people their lives back. 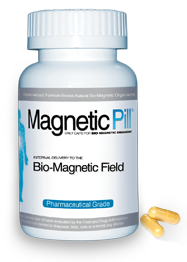 The Higher Balance Magnetic Pill is the only formula of its kind and is based on the principles of Bio-Magnetic therapy. You may have heard of traditional magnetic , or even electro-magnetic, therapies that involve the use of bracelets, mattress pads, or expensive electronic medical devices. Magnetic therapy is really a form of physical therapy designed to activate and optimize your body's natural healing mechanisms. The benefits are limited due to the strength and radius of the magnet and the depth they can permeate into the body. This is the old way. Working from the "Outside-In". What if, instead of one or two magnets, you could have thousands of bio-magnets working collectively all at the same time? Picture thousands of micro "super magnets" amplifying your magnetic field, using the electrical signals from the nervous system to unify their ability to communicate and permeate your entire body - from the "Inside-Out"! That's the Magnetic Pill. It is truly amazing. Each bottle of the Higher Balance Magnetic Pill contains 60 capsules!